This illustration was created for the Priori Skincare Company to explain eukaryotic cell anatomy as it relates to protein synthesis. 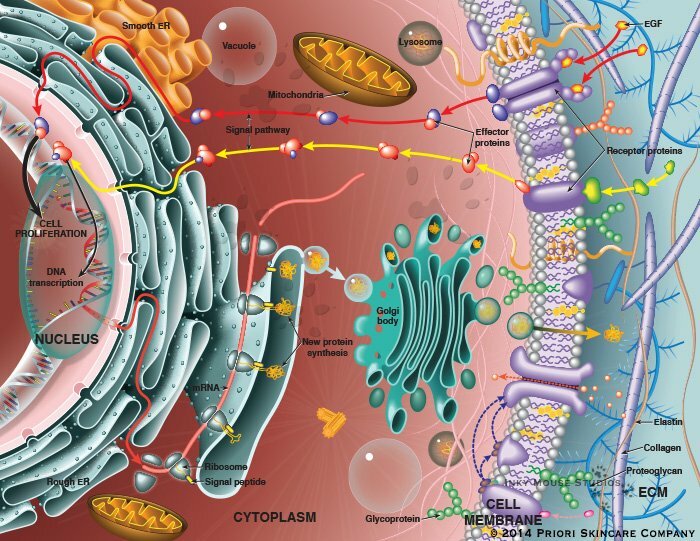 The illustration features the major organelles of the cell, as well as some components of the extra cellular matrix. The cell’s cytoplasm contains the nucleus, complete with a double helix DNA strand and a section of mRNA, rough endoplasmic reticulum, smooth endoplasmic reticulum, mitochondria, Golgi complex, lysosome and vacuoles. The extracellular matrix outside of the cell membrane, contains elastin, collagen and proteoglycans. The eukaryotic cell anatomy provides the framework and context for the protein synthesis pathway. This illustration shows the pathways for protein synthesis and DNA synthesis, in addition to explaining the basic biology of a eukaryotic cell. These pathways are simplified as much as possible, and then woven into the environment of the cell without being overly intrusive. The red signal pathway represents DNA synthesis, which leads to cell proliferation. The yellow signal pathway represents mRNA synthesis, which then travels out to the RER and instructs the manufacture new proteins that can be utilized inside or outside the cell. This was an interesting and very colorful illustration, with a lot of different elements which needed to be cleanly and clearly represented for consumer educational purposes. The end result was a client who was very happy with the finished illustration that was created from his concept sketch. This illustration was included in the article entitled The Skin Health and Beauty Pyramid: A Clinically Based Guide to Selecting Topical Skincare Products, published in the Journal of Drugs in Dermatology, April 2014, Volume 13, Issue 4.